I have always wanted to start my own vegetable garden, if you know anything about the non-organic vegetable market (like how they are chemically treated and stored etc) you will know that it can get pretty disgusting and a far cry of what it should be. The only problem is that I have no space outside my apartment, i.e. no garden, but hopefully it won’t always be this way. And when i do have the space I will be thinking about starting my own vegetable garden. There has always been something really nice about eating what you have grown yourself, and you know what 9/10 it even tastes better. I am completely digressing from this freebie, this offer will help with my goal as well as some of yours. It’s for a free copy of the “Burpee Vegetable Garden Guide”. 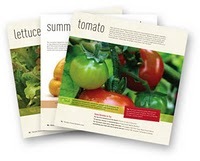 This guide holds your hand through the vegetable garden process, from what to grow, to how much and when.